Derm for Primary Care is a digital learning platform built for healthcare providers by healthcare providers. Learn how to identify, diagnose, and treat skin problems. Advance your career and gain a competitive edge in your field! Build foundations, move on to real life clinical scenarios and more. 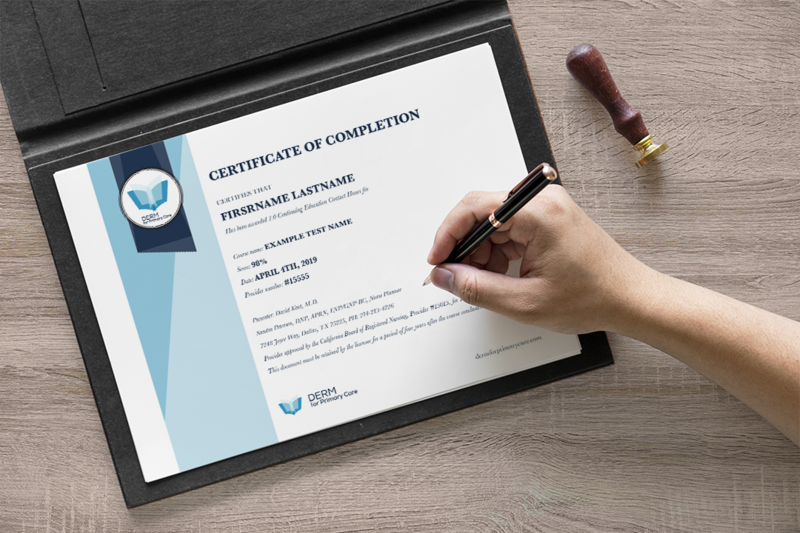 Earn up to 23 CE certificates* that can be accessed at any time on your dashboard. Learn at your own pace from your home or office from your phone, tablet or computer. The best dermatology training for your students with the best tools for your instructors! Our virtual classroom empowers you, instructors, and students to work together towards learning objectives. In-depth analytics and tools that put you in control and give you insights into your student's progress. We take care of on-boarding, and creating and presenting content, you decide how it's used. With our emphasis on practical dermatology, train your team and treat more dermatology cases in-house! Prepare your healthcare providers to treat routine and complex cases with standardized dermatology training. Effortlessly on board and train members all across your organization from billing to healthcare providers. White label our patented education and management platform so it works on your URL with your branding and your content.